This pattern comes from the book Fat Flakes number 1220 from Jeanette Crews Designs, Inc. 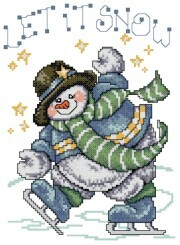 The pattern displays a snowman ice-skating while the words "Let it Snow," are above him. With Supplies: $25.10 You download the design. We will send you, 18 skeins of DMC Floss & Wichelt 14ct. 18" x 21" Aida (Nordic Blue) to complete your project.